Cats thrive on a grain free diet high in quality protein with moderate fat levels and low levels of carbohydrates. Cats thrive on a grain free diet high in quality protein with moderate fat levels and low levels of carbohydrates. 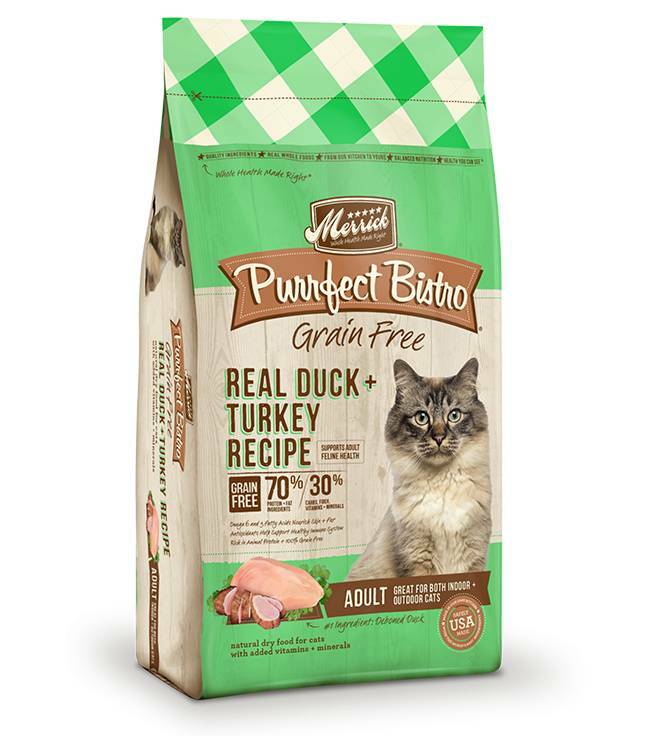 That's why Purrfect Bistro Grain Free Real Duck & Turkey Recipe Cat Food provides balanced nutrition using real whole foods. This natural, 100% grain free formula cat food is ideal for adult cats with a focus on nutrient rich ingredients to support overall health. Deboned duck is the first ingredient and, along with turkey and chicken meals, helps comprise the 74% protein level of meat sourced ingredients that are highly digestible and rich in essential fatty acids. Fresh produce like potatoes and peas provide easily digestible carbohydrates that offer the benefit of sustained energy without upsetting grain-sensitive digestive systems. This high-quality grain free diet is fortified with vitamins, minerals, probiotics, and antioxidants. Deboned Duck, Turkey Meal, Chicken Meal, Potatoes, Peas, Deboned Turkey, Natural Flavor, Potato Protein, Chicken Fat (preserved with mixed tocopherols), Sweet Potatoes, Dried Yeast Culture, Salt, Organic Dried Alfalfa Meal, Dried Whey Protein Concentrate, Choline Chloride, Minerals (Iron Amino Acid Complex, Zinc Amino Acid Complex, Sodium Selenite, Manganese Amino Acid Complex, Copper Amino Acid Complex, Potassium Iodide, Cobalt Proteinate, Cobalt Carbonate), Ground Flaxseed, Phosphoric Acid, Taurine, Yucca Schidigera Extract, Flaxseed Oil, Vitamins (Vitamin E Supplement, Vitamin B12 Supplement, Vitamin A Acetate, d-Calcium Pantothenate, Niacin, Thiamine Mononitrate, Riboflavin Supplement, Biotin, Vitamin D3 Supplement, Folic Acid, Pyridoxine Hydrochloride), Dried Bacillus coagulans Fermentation Product, Dried Lactobacillus plantarum Fermentation Product, Dried Lactobacillus casei Fermentation Product, Dried Enterococcus faecium Fermentation Product, Dried Lactobacillus acidophilus Fermentation Product.